Set up your motorhome inside Turn One at the speedway and you’ll soon understand why RV camping at a NASCAR race is the ultimate experience for racing fans. Whether you camp in the infield, next to the grandstand or in a lakeside campground adjacent to the speedway, RV camping NASCAR fans take racing mania to a whole new level. Ready to find out why? Here are the top ten things you need to know about camping in a motorhome at a NASCAR track. Some tracks have a waitlist or book their campsites months in advance. Check your track’s website for details on when a campsite can be reserved. Several venues for RV camping may be available at your favorite track—in the infield, on a terrace overlooking the racetrack, or even at campgrounds run by nearby sponsors/partners of the speedway. Depending on your camping budget, you can get as up-close-and-personal as you’d like to racing action. Know the rules for your campground before you go—things like whether external speakers are allowed, if motorized scooters and golf carts can be brought on racetrack property, what kind of coolers are allowed at the track, where towed vehicles should be parked and the hours quiet rules are enforced are important to know to keep things running smoothly during race week. The fan pages on NASCAR track websites are a great source of information for new NASCAR campers. Ask veteran fans your questions and get advice on how to maximize the fun. Knowing what to pack is the foundation of any great RV vacation, and that goes for NASCAR camping, too. If you don’t own an RV, but love the idea of camping at the races, we can help. 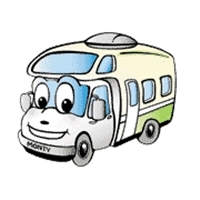 Renting an RV for a NASCAR vacation is easy and affordable. Services for NASCAR campers vary depending on the type of RV camping you’ve reserved at the track, from port-a-jons at every campsite to full-service hookups. You’ll also find a wide range of amenities to enhance your camping experience. Dover International Speedway, for example, offers RV camping race fans mobile pumping service and water delivery as well as a huge grocery tent with everything you’ll need for camping and tailgating during race week. And speaking of tailgating, what could you cook up in a fully-equipped motorhome kitchen? Use these tips to get your menu started, and don’t be afraid to experiment. You might just become a racetrack legend for your burgers, brats or muffalettas! If you’re ready to turn your next camping trip into a NASCAR vacation, there are plenty of places to visit. Did you know there are more than one hundred tracks in 38 states, as well as Mexico and Canada? Use this list of NASCAR tracks to start planning your next RV camping vacation at the track. What if you find you love NASCAR camping enough to buy season tickets? That’s a great idea! You’ll find that season camping passes have perks, like two tickets for the races or the chance to purchase additional tickets for your guests. Traveling to a NASCAR race in RV comfort, and camping close to the action with a whole lot of friendly racing fans can bring new meaning to ‘vacation’ for your family. Pick a race, get tips from motorhome camping NASCAR fans and reserve your campsite and an RV rental for race week. You know you want to!